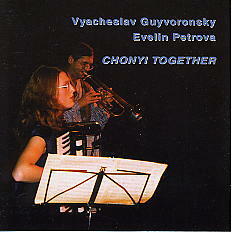 This new duo of Slava Guyvoronsky (trumpet) and Evelin Petrova (accordion and voice) will take the new music scene by storm! Chonyi is a Buddhist notion, one of the Bardo states, in which the soul wanders through mystic worlds searching for the depths of its own self. One of the eleven pieces on this CD, Celestial Yaha, was awarded the special Astor Piazolla prize for compositions in the Italian city of Castelfidardo in October 1998.